Tin Roofing Toronto (GTA) - Installation & Price Estimates: 647 - 521 - 7883 - Pro Roofing Inc.
Tin roofing has many benefits that it can bring to a home or business. While it shares the same advantages of strength, light weight, and durability with other kinds of metal roofing material, tin has the distinction of being distinctly less expensive than other varieties (copper, aluminum, zinc). Service life: Tin roof can be expected to last up to 50 years. 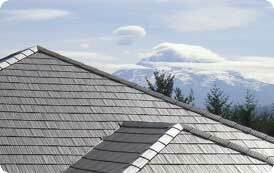 Noise: Modern tin roofs have an installed sheathing beneath which acts to insulate the rest of the home from the noisy raindrops. So long as a proper installation is done, noise isn't an issue. View our tin roofing gallery. Call to 647 - 521 - 7883 to schedule an estimate or contact us using an online form. Tin roofs are not 100% tin. Tin roofs are mostly comprised of steel, but have a tin coat to protect steel from corrosion. The tin is chemically bonded to the steel in a plating process where the steel is heated and saturated with molten tin. The steel and tin molecules that are rapidly vibrating because of the heat interlock and bond permanently to one another. There are two kinds of tin-roof coverings in common use, flat seam and standing seam. Flat seam: the sheets of tin are locked into one another at the edges, and nailed to the roof-boards. The seams are flattened with wooden mallets and soldered water-tight. Standing seam: Standing-seam roofing is that in which the sloping seams are composed of two upstands interlocked, and held in place by cleats. They are not soldered, but are simply locked together. Tin roofing can be installed on almost all architectural structure, no matter how flimsy the underlying construction materials seem to be. Before installing a tin roof, the uneven edges of the boarding should be smoothed off and the boarding covered with at least one thickness of sheathing paper or dry felt, to form a cushion and otherwise protect the tin. Knot holes in the boarding should be covered with pieces of heavy galvanized iron. Only the best quality of tin should be used, and it should be painted on the under side before it is laid. The outer edges of the tin should be turned over the upper edge of the cornice, and clasped to a strip of hoop iron; or, where it connects with a metal gutter, the two should be locked and soldered. Where a tin roof abuts a chimney or wall, the tin should be turned up sufficiently to prevent water from rising over it. This upstand should be counter-flashed with sheet lead; and abutting a wooden wall it should be turned up against the boarding, and the siding or shingles laid over it. The tin should also be turned up against all balcony posts, and the edges at the angles well soldered. The roof should be painted within a few days after it is laid, either with red lead in linseed oil, or a good asphaltum paint, particular care being taken to scrape off all resin before the paint is applied.